Pillar #3: Balance of Payment (BoP), International Trade & Orgs. Every teacher will try to justify that maximum number of questions came from his subject only. 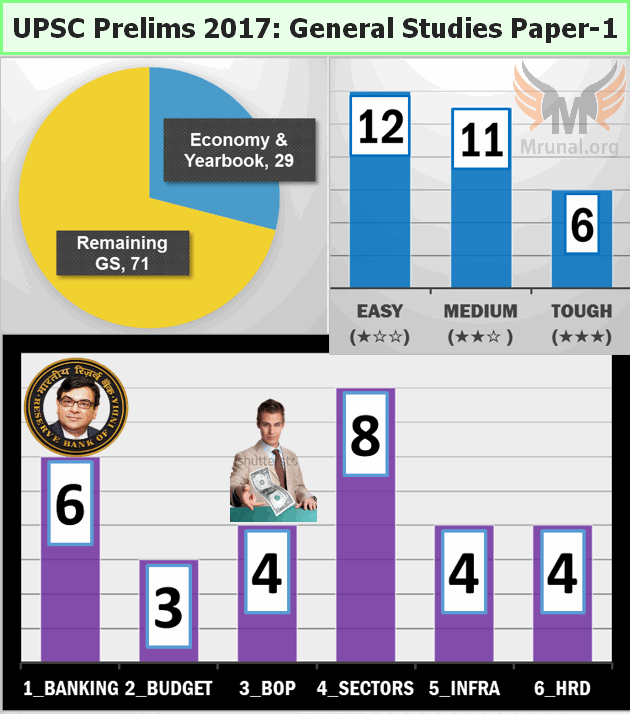 In my classification, it’d seem 29 questions are related to economy and yearbook. while others websites’ classification may differ depending on whether they put educational schemes under polity-governance and whether they put international funds, reports and bodies under Environment or IR. This time, I’m not putting agriculture schemes under fourth pillar (i.e. sectors of economy), because the way questions are unfolding in recent years, it’s better to treat agro schemes under Environment subtopic Agriculture, for faster revision. Nothing from budget 2017 provisions related to Railway! Fiscal deficit related question continuously asked in 2015 and 2016. Again asked with combination of Tax to GDP ratio. Stand up India, PM Mudra etc. easier to follow schemes. Tougher and obscure organizations and schemes such as NSQF, BIS, AGMARK, QCI etc. Easy questions about UDAY Bonds and district mineral foundation. Obscure summits and low profile institutes such as APMCHUD, Global infrastructure fund etc. Modi schemes: Vidhyanjali, Smart Hackathon. Atleast few MCQs were pure economics theory, such as how to curb fiscal deficit, or the components of capital budget. Pretty much every MCQ was either current or contemporary topics. Other than this, whatever I’ve to say about individual question, I’ve written it along with the answer itself. The question numbers correspond to “D” series question booklet. Bigger picture, overall analysis and strategy for future…that I’ll publish after the individual subjects’ answerkeys are over. 1. National Payments Corporation of India (NPCI) helps in promoting the financial inclusion in the country. 2. NPCI has launched RuPay, a card payment scheme. Mrunal’s Lecture on BES171/ Banking Transactions#3, both are correct. NPCi is a not-for-profit company formed by various banks, with primary objective of providing cost-effective payment solutions to the banks (so they don’t have to rely on expensive contracts of Visa, Mastercard, Infosys etc). But, NPCi’s solutions such as IMPS, BHIM, RuPay, AEPS etc. have indeed helped in financial inclusion. So first is correct. And second is correct- NPCi launched Rupay card in 2012, as 7th payment gateway in the world. Difficulty: ★☆☆ [very easy because explained in the lecture itself.] Current Affairs Span: 2008 when it was setup, to 2016- because of BHIM. 68. Which of the following is a most likely consequence of implementing the ‘Unified Payments Interface (UPI)’? (a) Mobile wallets will not be necessary for online payments. (b) Digital currency will totally replace the physical currency in about two decades. (c) FDI inflows will drastically increase. (d) Direct transfer of subsidies to poor people will become very effective. Mrunal’s Lecture on BES171/ Banking Transactions#3, “A” is the most appropriate choice. Mobile wallets will not be necessary, because your mobile number is directly linked with the bank account using bank’s ‘customized app’ which is built on the UPI platform. Difficulty: ★☆☆ [very easy because explained in the lecture itself.] Current Affairs Span: 2015 when it was launched to 2016 because of demonetization. 86. Which of the following statements is/are correct regarding the Monetary Policy Committee (MPC)? MPC has 6 members, not 12; and it’s headed by RBI governor and not Finance Minister. So statement 2 and 3 are wrong, hence by elimination, we reach answer (A) only 1 correct. Difficulty: ★☆☆ [very easy because explained in the lecture itself.] Current Affairs Span: 2014 when Urjit Patel Committee recommended this, to 2016, August when Government actually amended RBI act to implement this. 14. Which of the following statements best describes the term ‘Scheme for Sustainable Structuring of Stressed Assets (S4A)’, recently seen in the news? Mrunal’s Lecture on BES171/NPA#3 , S4A is RBI’s scheme for restructuring of corporate loans, hence “B” is the most appropriate among the given options. Difficulty: ★☆☆ [very easy because explained in the lecture itself.] Current Affairs Span: June 2016 when RBI notified this to Jan 2017 when Economic Survey mentioned this in its timeline under Volume 1, Chapter 4: Twin Balancesheet Problem. 65. What is the purpose of setting up of Small Finance Banks (SFBs) in India? 3. To encourage young entrepreneurs to set up business particularly in rural areas. While directly, indirectly, all three will be encouraged because of Small Finance banks. But Rajanbhai’s specific motives were 1 and 2 only, when he invited the applications in 2014. Hence answer only 1 and 2. Difficulty: ★★☆ [easy to tough depending on seconds thoughts in the actual examhall, about statement #3] Current Affairs Span: 2015 when RBI invited applications to April 2016 when first Small Finance Bank started operations. 54. Who among the following can join the National Pension System (NPS)? Chapter 13 Finance: NPS was compulsory for new central govt recruits (except armed forces) WEF 1/1/2004. so “D” is wrong. Chapter 8 Communication: Any Indian between 18 to 55 can join NPS. So “B” is wrong. PFRDA’s FAQ: can NRI open NPS account? Answer is yes, subject to RBI and FEMA norms. So we are left with answer “C”. Although technically, “C” is also wrong because originally it was new pension scheme (NPS), not National pension system- that term was coined only AFTER it was made open for all citizens. Current Affairs Span: 2003-04 when it was launched as new pension schemes for Government employees to 2009 when it was thrown open for all citizens and hence renamed as national pension system. 31. What is/are the most likely advantages of implementing ‘Goods and Services Tax (GST)’? 3. It will enormously increase the growth and size of economy of India and will enable it to overtake China in the near future. Exports will become ZERO RATED under GST, so statements 2 and 3 would have been correct If examiner had used moderate words “GST will help”. But he has used ‘extreme’ words. GST is unlikely to ‘drastically’ reduce CAD Because of crude oil import and OPEC cartel that manipulates its prices. Hence statement 2 and 3 are wrong. We are left with Answer A. Current Affairs Span: 2007, when it was first proposed in the budget to 2016 when it was passed. 3. The Act provides for three authorities for investigations but does not provide for any appellate mechanism. Which of the statements .given above is/are correct? Well, there is an appellate tribunal, and they’re required to finish case within one year. So #3 is wrong, by elimination, we are left with A and B. So, B is most appropriate because IT dept (=therefore Government) can seize the benami properties. Difficulty: ★☆☆ [easy through elimination] Current Affairs Span: 2016, when the original act of 1988 was amended. 1. Tax revenue as a percent of GDP of India has steadily increased in the last decade. 2. Fiscal deficit as a percent of GDP of India has steadily increased in the last decade. I’ve taken data from Table 2.1, page 46, Volume-1, Economic Survey 2014-15, and plotted it on this line graph. Now, what did the examiner mean by decade? (Gross) Tax : GDP Steady fall after sub-prime crisis (2007-2010) and then recovery. Except the fall in 2008 to 2010, there is steady growth. First statement is (mostly) right, except the slight fall during the GFC phase. Fiscal Deficit to GDP Decline between 2009-11. so statement #2 is wrong. Steadily declining from 2011 to 2016. so, statement #2 is wrong. Second statement wrong. Conclusion: statement #1 is either right or wrong depending on how much brain did the examiner apply over the word “steadily” vs how much hairsplitting did the candidate do over the word “steadily”? If we go only by the strict interpretation of above graph then answer should be “D”, but ultimate judge is UPSC’s official answerkey. Setting up of FRBM reform panel in 2016 and its report in 2017. American companies contend that India’s JN Solar Mission gives preference to procurement of solar panels with Indian content. This is one type of non-tariff barrier. WTO ruled in their favour. As such case had been going on since 2014, but in 2016, September when we lost the final appeal. Difficulty: ★★☆ [easy to tough depending on how to regularly you follow newspaper] Current Affairs Span: 2014 to 2016, September. 1. India has ratified the Trade Facilitation Agreement (TFA) of WTO. 2. TFA is a part of WTO’s Bali Ministerial Package of 2013. 3. TFA came into force in January 2016. Mrunal’s Lecture BES173/ BoP#3: WTO and other international organization. TFA came into force from February 2017. So, third statement is wrong, by elimination, we are left with answer “A”. Difficulty: ★☆☆ [Very easy through elimination.] Current Affairs Span: 2013 when this agreement was proposed in the Bali Summit to 2017, February when it became effective in India. India-EU BTIA negotiation has been going on for years, because of differences over data security, child labour and IPR. BUT I don’t claim this MCQ for my bogus marketing propaganda, because I have ‘officially’ demonetized the “L” series of lectures with the conclusion of BES17. So, I’ll give credit of this MCQ to India Yearbook 2017– Chapter 19, subtopic Bilateral Negotiations and IPR. Difficulty: ★★☆ [Easy to Medium depending on how regularly you follow newspaper] Current Affairs Span: 2007 when this agreement was proposed, to 2016-17 when it was again in news because of BREXIT etc. Term was coined by EU in 2015, and was in news again in March-2016 because of Brussel Summit. Difficulty: ★★☆ [Medium to tough depending on how regularly you follow newspaper] Current Affairs Span: 2015 to 2016. 27. Which of the following has/have occurred in India after its liberalization of economic policies in 1991? 1. Share of agriculture in GDP increased enormously. 2. Share of India’s exports in world trade increased. 4. India’s foreign exchange reserves increased enormously. First statement is wrong as per Page A6. This eliminates A and D.
So we are left with answer B- 2,3 and 4 correct. While it’s possible that in some years, FDI and world share in exports would have declined than previous years but by and large compared to Pre-LPG and Post-LPG, there is definitely an increase. Difficulty: ★★☆ [Easy to medium to impossible depending on how much hairsplitting you do, over the word “enormously”] Current Affairs Span: 2016, because it marked 25th anniversary of LPG reforms of 1991, hence it was in news. 1. National Career Service is an initiative of the Department of Personnel and Training, Government of India. 2. National Career Service has been launched in a Mission Mode to improve the employment opportunities to uneducated youth of the country. First statement is wrong, as per India Yearbook (IYB) 2017- Chapter 21 Labour & Skill development. Labour Ministry launched this portal in 2015..
Second statement is correct, by the same source- it’s a ‘mission mode’ project. Difficulty: ★☆☆ [easy or impossible, depending on whether candidate refers IYB or not.] Current Affairs Span: 2015 when this portal was launched. 11. With reference to ‘National Skills Qualification Framework (NSQF)’, which of the statements given below is/are correct? 1. Under NSQF, a learner can acquire the certification for competency only through formal learning. 2. An outcome expected from the implementation of NSQF is the mobility between vocational and general education. India Yearbook (IYB) 2017- Chapter 10 Education. If you read and interpret the objectives of NSQF under the subtopic “Bachelor of Vocational Studies”, then first statement is wrong, second is right. Difficulty: ★★☆ [easy to medium. Even in ‘tukkebaazi’ one can arrive at the answer, by eliminating the statement with extreme word “only”. But it’s a risky strategy in UPSC after the examiner’s Backbreaking moveTM against the 90+ walla guessmasters in Prelim 2017, if you observe the overall nature of questions.] Current Affairs Span: 2013 when this framework was approved. (c) Reserving some skilled jobs to rural and urban poor in some public sector undertakings. (d) Certifying the skills acquired by trainees under the National Skill Development Programme. Mrunal’s revision Lecture series for Mains 2015, L3/ HRD. (Powerpoint is available video is not) anyways, I don’t claim it under my bogus marketing propaganda, because video is not there to prove it. Another source: Indianexpress article in early-2016. Too bad India Yearbook 2017 did not cover this. Difficulty: ★☆☆ [easy if ever you’ve heard the concept. Because out of the given only “A” would fit properly. Otherwise, difficult] Current Affairs Span: this was part of 2015’s national policy on skill and entrepreneurship. It was again in news during October 2016, when Government expanded it beyond construction sector. 1. The Standard Mark of Bureau of Indian Standards (BIS) is mandatory for automotive tyres and tubes. 2. AGMARK is a quality Certification Mark issued by the Food and Agriculture Organisation (FAO). Second is wrong as per Mrunal’s economic survey summary 4 years ago. AGMARK is issued under Indian Act. Besides, it’s an ‘extreme statement’, FAO would not bother with small things. 1. It reiterates India’s commitment to the Doha Development Agenda and the TRIPS Agreement. 2. Department of Industrial Policy and Promotion is the nodal agency for regulating intellectual property rights in India. Second statement is right, Mrunal’s BES16/ Startup & IPR. Current Affairs Span: May 2016. 1. QCI was set up jointly by the Government of India and the Indian Industry. 2. Chairman of QCI is appointed by the Prime Minister on the recommendations of the industry to the Government. Current Affairs Span: as such QCI officials provide accreditation to the smart city, swatcch bharat etc. things. So it’s in the “Misc.” news round the year. 39. What is the aim of the programme ‘Unnat Bharat Abhiyan’? (a) Achieving 100% literacy by promoting collaboration between voluntary organizations and government’s education system and local communities. (b) Connecting institutions of higher education with local communities to address development challenges through appropriate technologies. (c) Strengthening India’s scientific research institutions in order to make India a scientific and technological power. (d) Developing human capital by allocating special funds for health care and education of rural and urban poor, and organizing skill development programmes and vocational training for them. Mrunal’s Lecture BES175/ Infra #2: Rural Development, Answer is “B”. Another source: India Yearbook 2017, Chapter 10- Education, subtopic Unnat Bharat Abhiyan. Difficulty: ★☆☆ [easy or impossible, depending on whether candidate referred IYB or BES15, or not.] Current Affairs Span: 2014 when this project was launched. 1. The first APMCHUD was held in India in 2006 on the theme ‘Emerging Urban Forms — Policy Responses and Governance Structure’. 2. India hosts all the Annual Ministerial Conferences in partnership with ADB, APEC and ASEAN. First statement is wrong because Official website says 2006’s theme was “A Vision for Sustainable Urbanization in the Asia-Pacific by 2020”. Besides, since 2016’s summit’s theme was emerging urban forms… as per PTI, so it couldn’t have been 2006’s theme. So both statements are wrong. India Yearbook 2017, Chapter 17 Housing- it mentions that APMCHUD’s ministerial conference is a biennial event so second statement is also wrong. Difficulty: ★★★ [difficult to memorize and recollect the inception years and themes of dozens of such faaltu summits conducted throughout the year.] Current Affairs Span: 2016, December when the 6th edition of this conference was held at New Delhi. 10. With reference to the role of UN-Habitat in the United Nations programme working towards a better urban future, which of the statements is/are correct? 1. UN-Habitat has been mandated by the United Nations General Assembly to promote socially and environmentally sustainable towns and cities to provide adequate shelter for all. 2. Its partners are either governments or local urban authorities only. 3. UN-Habitat contributes to the overall objective of the United Nations system to reduce poverty and to promote access to safe drinking water and basic sanitation. Statement 2 is wrong by the common sense that it contains ‘extreme’ word “ONLY”. However, just to be sure let’s cross check from their website– yes UN-Habitat also partners with private organizations and civil society also. Statement 1 and 3 are correct because of their “about us” page. Hence answer “B” only 1 and 3. Difficulty: ★☆☆ [easy to medium, depending on the risk taking power of the candidate during exam.] Current Affairs Span: In the recent years, UPSC examiner has acquired this habit of asking “about us” page of random international organizations, particularly those related to SDG, environment etc. difficult to place a date on such tucchi organizations. (a) ASEAN initiative to upgrade infrastructure in Asia and financed by credit from the Asian Development Bank. (b) World Bank collaboration that facilitates the preparation and structuring of complex infrastructure Public-Private Partnerships (PPPs) to enable mobilization of private sector and institutional investor capital. (c) Collaboration among the major banks of the world working with the OECD and focused on expanding the set of infrastructure projects that have the potential to mobilize private investment. (d) UNCTAD funded initiative that seeks to finance and facilitate infrastructure development in the world. Difficulty: ★★★ [It’s already difficult to memorize and recollect the fifty dozen international funds and organizations associated with environment, let alone Infrastructure.] Current Affairs Span: 2014 when it was launched. 5. With reference to ‘National Investment and Infrastructure Fund’, which of the following statements is/are correct? 2. It has a corpus of Rs. 4, 00,000 crore at present. NIIF is under Department of Economic Affairs. So first statement is wrong. It was setup in Budget 2015, with Rs.40k crores, but even if counting the recent allotments till Budget 2017, 4 lakh is beyond its aukaat. So, second statement is also wrong. Difficulty: ★☆☆ [Easy because verbatim covered in the lecture.] Current Affairs Span: Launched with Budget 2015 and was in news during March 2017, because of Indianexpress report on how this fund has yet failed to achieve anything. While I put skilling schemes under fourth pillar (Because fits well with make in India and skill India revision) but I put educational schemes under six pillar HRD, because that fits well with computation of HDI index. 84. Which of the following gives ‘Global Gender Gap Index’ ranking to the countries of the world? Difficulty: ★★☆ [easy or medium depending on how regularly you follow newspapers. Tough by tukkebaazi because then most likely choice would be UN women!] Current Affairs Span: 2016, October when latest report came out. 98. Which of the following are the objectives of ‘National Nutrition Mission’? 1. To create awareness relating to malnutrition among pregnant women and lactating mothers. 2. To reduce the incidence of anemia among young children, adolescent girls and women. 3. To promote the consumption of millets, coarse cereals and unpolished rice. 4. To promote the consumption of poultry eggs. Fourth Statement is right as per its guidelines on Ministry of Women and Child Development, Appendix 4. But, within that guideline, I’m unable to find reference to promotion of unpolished rice and millet. Hence C is the answer. Current Affairs Span: 2010 it was launched, to 2017’s Budget when child activists congratulated Government for increasing its funding. 38. What is the purpose of Vidyanjali Yojana’? 1. To enable the famous foreign educational institutions to open their campuses in India. 2. To increase the quality of education provided in government schools by taking help from the private sector and the community. 3. To encourage voluntary monetary contributions from private individuals and organizations so as to improve the infrastructure facilities for primary and secondary schools. Indianexpress June 2016: HRD Ministry has launched an initiative called ‘Vidyanjali’ to encourage youngsters to volunteer their services at any neighborhood government school. So accordingly “A” is the most appropriate choice. What about statement “3”? While the mygov.in portal guidelines mention that Vidyanjali will cover initiatives under CSR, PPP, PSU. But mobilization of voluntary monetary contribution is not the primary and explicit ‘purpose’ of the scheme. Hence 3 is wrong. Therefore, Answer is “A”. if a candidate had prepared IYB chapter on Education, then he’d feel he is covered all tucchi schemes with sanskritized names comprehensively but this one is not given there. Modi is a free man to launch daily new campaign on mygov.in with Sanskritized names but without budgetary provisions- Adarsh gram, Gram uday se bharat uday and so on… it’s already very challenging for an aspirant to memorize all of their salient features. Current Affairs Span: June 2016, when this scheme was launched. 85. Which of the following statements is/are correct regarding Smart India Hackathon 2017? Current Affairs Span: In October 2016, newspapers had reported that it’ll be conducted in January or February 2017. It was finally launched in 1st April 2017. so, this is the ‘most latest’ question asked within Economy, Yearbook, Scheme segment of Prelims 2017. therefore, one should keep habit of reading newspapers, because even if you missed it in October 2016, still there was again chance you could have spotted it in April 2017. Remaining parts of the Answerkey will be uploaded as I finish analyzing them. Any corrections, do post in the comments but with authentic source reference. 2. सबसे ज्यादा बार और सबसे कम बार किन राज्यों में लगा है और कितनी बार? 3. अब तक कुल कितने संविधान संशोधन हुए हैं ? 4. संसद, विधायिका, पंचायतों और नगर पालिकाओं में महिलाओं के latest आरक्षण कितने हैं? Mrunal sir…in question in tax revenue to gdp…u have used data of only central govt tax revenue wrt to gdp…whereas in tax revenue u should have added contribution of states as well…as done on oecd website…then the graph would turn out to be more of non steady increase one…. Yes this is correct. The grapgh clearly shows an increasing trend. The answer is obviously “a”. Yes that graph clearly shows a steady growth. So ‘a’ should be the correct ans. Regarding tax to GDP Option A? Sir prior learning scheme is not only for construction workers. It is for all kind of traditional knowledge, so this can’t be correct. Hence, statement4 seems more appropriate. There is no mention of mobile wallets. So it seems “d” is the appropriate ans. Yes Kishan yo do have the same point. UPSC might have been referring to 1988 act and not the amended one. Sir, please clarify that doubt. big fan of mrunal bhai. last ke 2.5 days i somehow finished his bes 17 series and it did help me fetch 7-9 marks extra. bhai Mobile wallets will not be necessary for online payments in q. 68 is a feature of BHIM APP. verbatim from this link http://www.upiwalletpayments.com/aadhar-based-bhim-payment-app-download.html . i think upi wale ka and hai D subsidy –easy–to poor. page 4 of this npci upi doc(http://www.npci.org.in/documents/UPI_Procedural_Guidelines.pdf) proves that upi will not eliminate mobile apps. “Flexibility for Payment Service Providers (PSPs) – Payment System Providers can build functionality rich mobile apps using UPI.” bhai please reply. this q will decide my career. My doubts r…1)upi…question z dey hv asked consequences after upi..option is..mobile wallets not required for online payment…but dats d case even bfr upi..v can use debit/credit cards….2)adjournment motion…3)national carrear service..no where in d site its mentioned dat dey wud give emplymt to uneducated…its given skills to unskilled..emplymt to unemplyd…aftr skill training will search for suitable job…4)r.t.vote..i feel its constitutional(most controversial bit of dis pre 2017😅)…and other 2 or 3 r der..but hvnt searched on dem in detail like..1)dat skill and construction worker one…2)nutrition mission..am wid sir..bcose its mentioned even in national nutrition policy..for poultry…3)port question..can b motupalli mostly..and questions like butterfly..bioremediation..e.t.c..
Paper-I= 87.33 SC- is there any chance for mains. Sir, in question 78 don’t u think option D is more appropriate..
Kamini u r absolutely rt, bcs in benami property act has three authority and no appelate tribunal. In recent amendment adjudicating authority and appelate tribunal have been added. So i think statement 3 is right. @ mrunal – Referring to question 98 (National Nutrition Mission ) , in the same document of which you have given link – page 35 , point number 13 mentions Expanding TDPS to have “MILLETS” , PROTIENS etc . Hi. In the question where it’s mentioned that the tax revenue to GDP ratio of the country has steadily increased the past decade, shouldn’t we take the base year as a common denominator? The graph in the economic survey plots it over a certain period. But to compare two or more values, a common denominator is usually the norm in economics and mathematics. By this logic, the second statement is definitely incorrect. The first statement could be correct because, if 2011-12 is taken as the base year, then, over the decade (except for a 0.3% decrease once), the tax revenue has increased. What do you think?